1,Wipe away dirt and dry completely. 2,Choose the install position and mark. 3,Peel off the backing but do not touch the adhesive,Press the adhesive firmly against the clean surface. 4,Squeeze out the air from the sticker,make sure it fit the wall perfectly. 5,Mount the shelf and fix it. 6,Wait patiently for 24 hours without puting anything on the shelf. 1,Wipe away dirt and dry,choose the install position and mark. 2,Drill 6mm diameter hole with electric drill. 4,Drive in and screw down the screws. 5,Put the screw covers on. 6,Check its fastness,then use it right away. 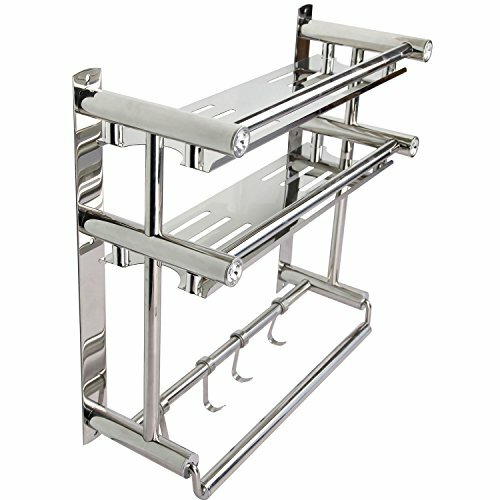 Characteristic:High-capacity with 3 tiers bathroom towel bar,4 Towel Hooks. Two shelves for extra storage . You can choose two installation methods(drilling hole ro no ) Gift :6 Superior Suction Cups to hold shelf in place. Stays Put, Yet Easy to Move: Featuring strong, long-lasting suction, our bathroom basket storage caddy adheres securely to any smooth surface. Yet it's easy to remove ,No drilling needed. Never Rust: Stainless steel construction, ensuring quality and longevity. If you have any questions about this product by PNBB, contact us by completing and submitting the form below. If you are looking for a specif part number, please include it with your message. By JUST SUK IT UP!